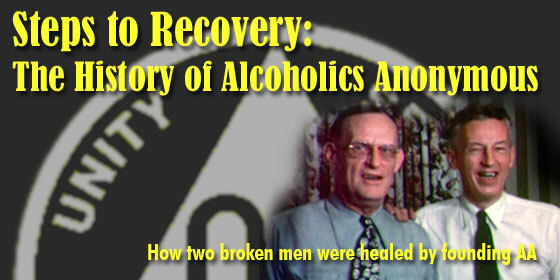 Eight decades ago in the middle of the Great Depression two broken men, Bill Wilson and Dr. Bob Smith—both “raging alcoholics”—met at a time of great personal crisis for each. Bill had maintained a fragile abstinence from drinking for a few months but felt suddenly at risk of relapse while on a disappointing business trip. His “epiphany” was that only by reaching out to help another alcoholic could he safeguard his own sobriety. The man he contacted (through a concerned friend), Dr. Bob, was, at that moment, drunk and had passed out under the dining room table. Their actual first meeting, the following day, would give birth to Alcoholics Anonymous, a remarkable service organization that has helped the lives of tens of millions of alcoholics. AA’s basic text, known informally as “The Big Book”, has sold more 35 million copies in English alone. This documentary explores the history of AA’s founding, including excerpts from films and a play reconstructing the events. We cover the development of the Twelve Steps of recovery, which laid out how people trapped in addiction can find a way out. And we chronicle the astounding growth of AA into a worldwide fellowship.